Sheng Zheng Wei, nicknamed Haodi, from Shandong Province, China, and ‘adopted’ by many in America returned to China from Shriners' Hopital Burn Unit in Boston...once again. Her first trip to Boston in 2007 saved her life. This current visit to Shriners Burn Hospital continued the surgery needed to make necessary changes for Haodi’s life and looks. Haodi was less than 1-year-old when a tipped pot of boiled noodles poured down her face in 2006. The burns were so severe, that her neck and chest fused together making it extremely difficult to breath and eat. There was a national outcry for help in the media and on the internet in China. 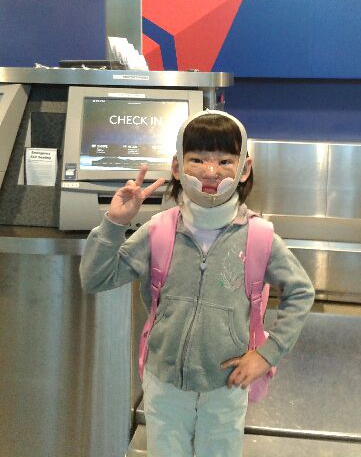 With the support of donors, Children’s Hope was able to fly Haodi and her mom to Boston on the last day of 2006. It took expert surgery at Shriner’s Hospital to keep Haodi alive. After nine months of operations and therapy, Haodi and her mom were able to go home to family in China. The family knew however, Haodi would have to return to continue for several rounds of reconstructive surgery. In March (2008), Children’s Hope flew Haodi and her mom to Boston for a second trip, as well as finding volunteer families to assist with transportation and housing. The former visits were a success in literally saving Haodi’s life and working toward restoration of her face. The care at Shriners is free, but there are transportation and everyday expenses for Haodi and her mom while in Boston. To help cover those costs fro Haodi and other suffering children, please click here.